To begin a laparoscopic extravesical reimplantation, trocars are placed at the umbilicus and the right and left midclavicular lines. Trocars at the umbilicus and contralateral midclavicular line are working ports and the ipsilateral port is the camera access with a 30° lens. In the older child with a larger pelvis the contralateral working port may be placed slightly lower than the umbilicus on the midclavicular line to increase the working angle of the instruments. This helps with eventual suturing and knot placement. A final working port is placed midline in the suprapubic region to manipulate the ureter during suturing of the extravesical tunnel. Postoperative care includes antibiotics and analgesics. 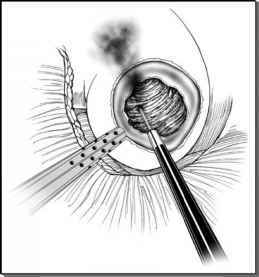 A Foley catheter is not left in place unless a hole is made in the mucosa during creation of the tunnel. In that case, overnight drainage should be adequate with the Foley removed the next morning. In an uncomplicated case, the child can be expected to go home the same day as surgery.